Watch for Hope Prevails Bible Study! Sometimes we struggle to get through the day. And even as Christians, we wonder if anyone understands. Rest assured, someone does. Michelle Bengston, author of Hope Prevails carries many titles. Besides wife and mother, she’s also a Board Certified Clinical Neuropsychologist and helps people every day. But she also understands depression from the inside out. She’s dealt with her own depression and found that no matter how dark it gets … hope prevails. She published Hope Prevails: Insights From a Doctor’s Personal Journey Through Depression last year to rave reviews and is now offering her newest book, Hope Prevails Bible Study, being released October 25th. Watch for it! You can also follow Michelle and learn more about both books, Hope Prevails and Hope Prevails Bible Study at http://drmichellebengtson.com/. The value of words is immeasurable. They shape our lives and determine how we see the world around us. Because of their power, we need to monitor what we hear and read—and think. Christians tap into specific words of power and comfort. Because of the power in words, it’s imperative for Christ followers to be on our guard against damaging words. Satan wants to destroy the lives of Christians, often using our own words against us. Stop the madness! Don’t let these words find residence in your heart. We all have past experiences that helped we’d wish weren’t there, but we can control which experiences define us. If you’ve followed me for any time at all, you’ve read posts I’ve offered from author (and good friend) Lori Roeleveld. In her latest blog, she challenges the reader to look around them and see all the opportunities they have to excel at being the best Christian they can be. All this, as done in true Roeleveld style, without piling on shame. This post will bless you as well as move your heart. Lori Roeleveld has done it again with her book, Jesus and the Beanstalk: Overcoming Giants and Living a Fruitful Life. Once again she’s tapped into my person—my being—and wrote thoughts I only dared acknowledge to myself. Reading this book, it’s as if she’s given a voice to my fears and challenges, and allowed them to the surface where I can see them for what they are. Time after time I’d cover a portion of her book, only to stop reading and ponder not only her words but marvel how God has used this person to tap into different areas of my life and address them scripturally. I particularly liked the section, The Christian You Don’t Know. Affirming and challenging at the same time, only in the way that Roeveleld can do. And her ability to wrap a point in humor is uncanny. Thou Shalt Pray Like Sheldon Cooper is just one example of many of how she offers wisdom with humor. I can’t wait to read this book again. Don’t be afraid to start Jesus and the Beanstalk with an open mind. You will not be disappointed. It’s been such a long time since I’ve written. Life certainly has a way of getting big, and mine did … in spades! Work, having family visit, us visiting family, and finishing my preparation for a writer’s conference this month have all been pulling at my time. But I have a good friend, you see … and this friend wrote this incredible book … and I had to stop my life’s tempo to share it with you. 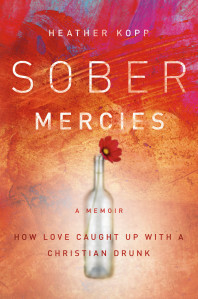 Sober Mercies: How Love Caught up with a Christian Drunk (Jericho Books) is more than a book about the need for recovery. It’s a story about what happens after someone addicted to alcohol lives with recovery. And it’s about how someone who has a relationship with Christ can suffer from addiction. My heart went out to her. And I wondered for the umpteenth time if we Christians don’t make the most miserable addicts. Since we tend to think of addiction strictly as a moral failing, most of us try to pull ourselves up by her spiritual bootstraps. We pray harder, repent more fervently, and fight temptation until we’re blue in the face. When our best efforts proved futile, we feel even more guilty and ashamed. And confused. Don’t we love God enough to quit? Doesn’t God love us enough to deliver us? Meanwhile, to even admit that we have become addicted feels like a trail of Christ’s work on the cross. Dealing with addiction as a Christian can destroy not only the person affected, but other aspects of their lives as well. Heather’s honest account of coming clean with the lies and deceit that held her captive for years—all the while working as a Christian writer—is enough to make Sober Mercies a worthwhile read. Sober Mercies is also an incredible love story. It’s a story about Heather’s love for her God as well as her Chardonnay. And it’s the strength that she pulls from her love for her husband, Dave, that gives her the courage to dip her toe into the pool of transparency and try to put order to the chaos surrounding her life. As Heather takes us on her journey out of that chaos, we meet several people who impact her life along the way. We meet Susan, a recovering alcoholic, who shows her that a happy life without drinking is possible. There’s Nicole, a friend from rehab, who for a time is the only person she can talk openly with. Then there’s Kate, her sponsor, who guides her though the minefields of step work. And we see the love Heather has for her children. Even though her damaged life influenced her boys, Noah and Nathan, her example of giving up the need to control lights the way to sobriety. But most of all, Heather shows the relationship she has with God. Not the condemning or shaming God that has sometimes been associated with drinking to access, but Jehovah Rafah, the God who heals. You will read of one account after another how God offers hope to her along her journey. Sober Mercies is not just for struggling Christian addicts, it’s for anyone who dares to seek an honest relationship with God. It’s for anyone who loves an addict—recovering or practicing—and wants to understand what types of demons they have lived with. It’s for church leaders who know that recovery isn’t experienced within a cookie-cutter format of healing. Addiction isn’t just sin. Addiction isn’t just a physical condition. It’s both, and Sober Mercies shares that like no other book I’ve ever read. Get yourself a copy of Sober Mercies, your life will be enriched by reading it. I recently posted a blog that used a quote from Oscar Wilde’s, every sinner has a future and every saint has a past. The blog had a good message, but the quote stayed with me long after I forgot the blog. I looked into Wilde’s life a bit and understood how these words could have come from the depths of his being. Both parents were successful and he, too, was a success. But the examples his parents offered him were filled with selfishness and narcissism. Reality had little importance; perception counted more than anything. Under their direction, he learned how to deal with living a double life. He was on top of the world until he went to court to save his reputation. He lost soundly and his fall was precipitous, instantaneous, and very frightening. Wilde was heralded as a brilliant man because of his writing ability. But in truth, his life was tortured. Not because of his homosexuality—although his life style landed him in prison—but because he sought after beauty first and then morality … if seeking it suited him at the time. I sound like I’m coming down on Wilde, but I’m not. In truth, I’m only using his life for an example. Living for perception or living for truth haunts us all. I remember clearly when I stood at the crossroad of Wilde’s Sinner or Saint. I chose a Sinner’s life: seeking beautiful experiences and possessions. It didn’t take long, however, until I realized my life was lacking depth, and something. It was shallow and short-sighted. I tried to fix it with more experiences and controlling the world around me. Nothing fixed what was wrong and my life was circling the drain. He loved me completely. He loved me because he created me. He didn’t judge me because of my brokenness. Instead, he tended to my wounds. And he didn’t let me skate regarding my past choices. Because he loved me, I still needed to deal with the consequences of my bad choices, but he was with me every step of the way. I appreciate his love more as each day goes by. I remember my sinner days and am forever amazed how God still loves me. Every sinner has a future and every saint has a past fits us all. Don’t allow your sinner days to own you. God’s waiting for you, too. Entry #3 – Am I Worth It? During Launch Week, (December 9-15) for Doug Bender’s, Live Second, I have been asked to participate in writing blog entries telling the story of my spiritual journey as it correlates with separate entries from his book. Come along and experience … and learn why I live second. The day that I realized I was addicted to relationships (co-dependent) was the best day—as well as the worst day—of my life. The best because I learned that there were other people just like me who learned to control their compulsion and that if I followed their example, I would be able to manage my compulsion, too. And it was the worst day of my life because I realized I had an emotional condition that could never be healed; only controlled. Just as those dealing with Diabetes who need to take insulin on a regular basis, I would always need to manage my compulsion. Listening to healthy people who understood my addiction, I learned that there were aspects to this condition that I was responsible for, and they guided me in addressing what mistakes were mine. I learned to accept the fact that if Paul, hero of the First Century church, struggled with doing what was not right, I needed to stop expecting perfection from myself. God wasn’t interested in me pursuing my perfection, but accepting his. That included being transparently honest about my brokenness; with Christ as well as the support system around me. In addition to learning how to be honest, I focused my time searching Scripture for promises from God telling me that I was worth it. After my last divorce, I knew I needed to look at my life differently. I asked God to be my first love. I asked him to put blinders on my eyes so I could stay focused on only two things: getting closer to him and being the best Mom I could be to the children he blessed me with. As I read scripture, his word came alive with promise after promise. I often returned to some of my favorites in difficult times: Jeremiah 29:11, Proverbs 3:5-6, and Hebrews 13:5. I came to the realization that because I was addicted to relationships, I needed to steer clear of them. Just as a recovering alcoholic needed to stay away from alcohol or where alcohol was used, I needed to stay away from men. Once I accepted what was controlling my life, I knew I had to live differently. I stopped dating completely. I concentrated on what I needed to do to be healthy. I focused on my children and my Lord. I read my Bible every day and spend much time in prayer. I was in church every time the doors were open. I focused on being the parent I needed to be to my children. I had a plan again, but this time it was centered on who God wanted me to be. And God met me where I was. I was still co-dependent but learned that I could be thankful for my condition. In my addiction—my brokenness—I was able to clearly see my need of a Savior. I needed to be second. I was so close. I knew what I wanted and I knew what to do to have it. But knowing was only part of the battle. I had to do what God wanted me to do. I still needed to understand and trust God. Would I—an addict—be willing to put God first? Follow me into the last blog of this series and see how I find release from my demons. Tweet using #IASaddict to share your thoughts. So I’m codependent. What does that mean? When did that start? When I was young, all I ever wanted was to have a special person love me. Was that too much to ask? I’d seen good relationships, so I knew they were possible. But storybook relationships always seem to be illusive to me; always out of my grasp. What started out as something very good—having the goal to be in a loving relationship—turned into something very damaging. It wasn’t long before I went from wanting to be in a relationship, to needing to be in one. I was obsessed. This obsession started when I was seventeen. I decided—with all the wisdom that I could muster up at that age—to fix all my life’s problems, I would need to be married. I reasoned that I would be happy if a fella stood up in front of our families and friends promising to love me forever. That, I reasoned, would make my storybook life come true. That’s when I would have everything I ever wanted. Then I would be ready to start living my happily-ever-after life. But it didn’t happen that way. By the time I was twenty, I was married … and divorced. Yet my failure did not deter me. I still had a plan. I soon set out in search for my next special relationship ( or should I say victim). It didn’t take long for me to find someone else; and soon I was married again; this time I was additionally blessed with two children. It wasn’t long before I decided I wasn’t happy after all. Another divorce. Next time, I reasoned, would be the right one, for sure! When the next relationship came around, I remarried without hesitation, adding one more child to my nest. Yet after a few years this relationship, too, had a disastrous end. By the time I was forty, I had three marriages and divorces behind me. I was a Christian. How did I allow this craziness into my life? I always thought God wanted me to be happy. I was trying to find that happiness the best way I could. Yet with all my efforts, my life was still out of control. My days were filled with either depression or anger. I had tried—really tried—to do what I thought I was supposed to do. Yet I dealt with one failure after another. Could it be that I was out of line with this relationship thing? It became clear that my need to be in a relationship was more important than anything else. This need for someone special was controlling me. And the relationships I was choosing were not healthy ones. What a fool I had been for all those years. I thought I was in control, yet my life was a train wreck. What had happened to my plan? It looked so good when I started; it made sense at the time. With the help from healthy Christians, solid friends and getting back to scripture, I realized my focus was all about pleasure. My obsessions—relationships with men—were my masters. Instead of controlling my surroundings, my surroundings were controlling me. Instead if finding the happiness I always wanted, all I had in my life was shame, guilt and resentment. I needed to make a change. But was I too damaged? Could this destructive cycle even be broken? Could I break this life of addiction and learn how to live a healthy life? After so many years of selfishness, did I really want to put Christ first and live second …? Find out in my next blog how I learned to deal with addiction. Tweet using #IASenslaved to share your thoughts.